It’s Time to Control Your Time! You work in a profession where, despite your best efforts to plan your working week, your daily activities are often dictated by circumstance rather than strategy. You are sick of the constant juggle and live with an ever-present undercurrent of stress. You simply don’t have enough time. And time for a quality life outside work? Forget it! You know that something needs to change so that you can continue to be a great doctor and live a more integrated work/life. Imagine if you could gain Control over your time. Bestselling author Kate Christie will help you invest your time to find your lost time. 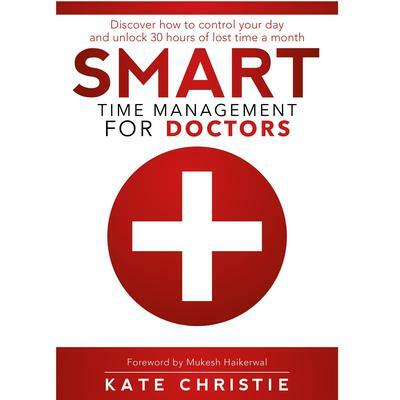 Smart Time Management for Doctors provides a proven 5 Step process along with practical and easy to implement productivity strategies to help you identify and harness 30 hours of lost time a month. "Kate Christie is a Time Management expert, best selling author and dynamic international Speaker with a passion for teaching professionals how to gain control of their time – she will take you from extraordinary to unstoppable. I’ve never met anyone so incredibly passionate and so hugely capable when it comes to helping people take control of their time – the number one issue we all face in life. Her laser like focus is to help people take control of their time to ensure more meaningful success across career, family, community, and life. 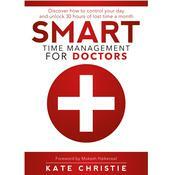 Kate has now delivered the definitive workbook to help Doctors gain control of their time. My advice is simple, if you’re a doctor or work in the medical industry take the time to read everything Kate does. Her advice really does have the potential to change your life. Many people promise this, few deliver, Kate Christie most certainly does!’ – Andrew Griffiths, International Bestselling Author and Global Speaker. It’s Time to Control Your Time! You work in a profession where, despite your best efforts to plan your working week, your daily activities are often dictated by circumstance rather than strategy. You are sick of the constant juggle and live with an ever-present undercurrent of stress. You simply don’t have enough time. And time for a quality life outside work? Forget it! You know that something needs to change so that you can continue to be a great doctor and live a more integrated work/life. Imagine if you could gain Control over your time. Bestselling author Kate Christie will help you invest your time to find your lost time. Smart Time Management for Doctors provides a proven 5 Step process along with practical and easy to implement productivity strategies to help you identify and harness 30 hours of lost time a month. – Andrew Griffiths, International Bestselling Author and Global Speaker.